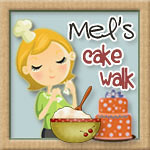 Hello, and welcome to my cake blog! Let me first address how this blog came to be. A few months ago (around October) I became very disenchanted with studying for my qualifying exams. (Don't worry, I still managed to pass...) Anyway, one of my welcomed distractions from studying was watching Cake Boss on TLC. It only took one episode and I was hooked. Since then, I've been voraciously devouring any and all information I can find on cake decorating. I thought I'd take the first entries of this blog to talk about my sugary adventures prior till now, sharing some pictures and discussing how I learned various techniques, what supplies I've used, etc. After I bring the blog up to speed with everything I've already done, I will begin taking on different projects and techniques and sharing my learning experiences with you. I will also try to post other cake blogs I'm reading, recipes I want to try, other cake eye-candy websites, and supply websites I look at. I hope that I will be a valuable resource to all of you who might have caught cake-fever after watching your favorite cake shows. Or if you're more interested in pretty pictures and witty comments, I hope I can provide those as well. I am very satisfied with your works. Your topics are so interesting as well as your recipes. Keep it up. You still have a long way to run in blogging but I can see the talent you have. Keep it up! I hope to see more of your great works.